Wirral Council had another public meeting in private (an assumption on my part as I wasn’t there) on Monday afternoon to obtain councillors’ agreement to a recommendation to save money by spending an estimated £1.4 million and increasing the salary of the Monitoring Officer to try and solve recruitment issues to this post. The move also marks the imminent departure of the last of the three strategic directors hired when Graham Burgess was Chief Executive Joe Blott (his arrival and departure were both claimed to save money). If agreed by councillors he will receive £93,412.60 severance and receive his pension early at a cost of £296,763.43 (total £390,176.03). As the proposed severance amounts to over £100,000 all councillors will have a vote on it at a future meeting. After the headlines in 2015 over Kevin Adderley’s departure, the report recommending Blott’s early retirement implies that councillors have no choice. Spending an estimated £1.4 million to save £750,000 a year on salary costs probably sounds to the public as a nonsense, although in the strange world of local government finance it can be done. To borrow a W1A quote, local government appears at the moment is about “us identifying what we do best and finding more ways of doing less of it better”. As Wirral Council’s auditors pointed out, in their opinion Wirral Council doesn’t provide value for money in this area, the areas that caused this were identified as governance ones in the OFSTED report and it’s already been pointed out that progress is too slow. A Blott on the landscape has gone, thogh! A Blott on the landscape has gone, though! At this stage it is only a recommendation (presumably it will be made in 2018. As pointed out in the article after large payoffs were made to departing council officers the law was changed so that all councillors had to be involved in such decisions involving large severance packages. It looks like Joe Blott has being doing bugger all for the past year then. A different way of working would be to stop acting like you are more than public servants and do what needs doing and stop empire building. This hub ,that hub …goodness me, just empty the bins will ya!! In fact a lot of council services are outsourced. Quite how they’d be run if public money wasn’t siphoned off so that private companies can make profit I’m not sure! So if i get booted out of my ****** job, i can have my pension too? And if they want to save money, please Council ask me i can save you millions, it means sacking everyone, as for the services we pay for now are a joke, sack them all and start again, every single one of them and that includes all the contract firms who repair the roads, tickets on parked cars, clean the streets to fixing the street lamps the lot goes! Also if you sacked everyone without cause, it would trigger a lot of Employment Tribunal cases. The terms for the departure of Mr Blott were not agreed to by myself (as the sole Lib Dem on the committee) or by the two Conservative Members of the committee. lesser job should be offered.to the officer. The Conservatives backed that Motion. Having sat through many Employment and Appointments Committee meetings where a similar scenario has happened, personally my view is that no political party should have a majority on the Employment and Appointments Committee to encourage consensus. 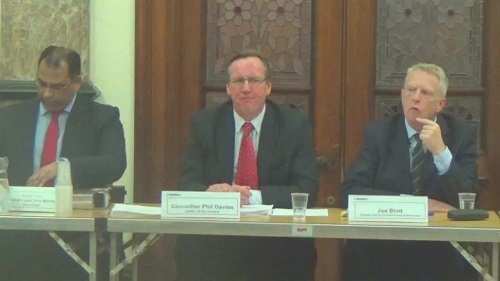 Wirral Council could change the political composition of committees if it wished to do so. On the other point you’ve raised, the same issue was raised at an Employment Tribunal earlier in the year in which Joe Blott was a witness. To summarise Wirral Council’s position then, it was that employees’ jobs and salary grades can be changed for reasons that are deemed to be unconnected to either whistleblowing or performance by that employee. The employee’s choice is then to either accept the salary cut or chose to leave. Obviously there is a third option of redeployment in a different position or promotion, but that depends on suitable positions being available. The decision you refer to however implies the situation is different if you are a senior manager. Treating different grades of employee in a different way is the sort of thing that unions often feel is unfair.